We were scheduled to babysit Louisiana granddaughter Molly Kate Friday evening, April 9, in Prairieville, southeast of Baton Rouge, and return home Saturday. Husband Walter never misses an opportunity to throw in little side trips, but all was not quite as he expected. Our first stop in Louisiana Friday morning was the welcome center just over the state line on Interstate 10. We had stopped there before, but as we slid out of our van, the curb looked like a caterpillar Mardi Gras parade. Hundreds, thousands, maybe millions of the creepy crawlies were cruising the curb. A few steps farther and I could see them all over the edges of the Welcome Center sign, hanging on long strings from the tree, and exploring the outside walls of the center. When I started taking pictures, the welcome-center supervisor invited me over to see even more covering the trunk and limbs of an oak. He said they were bagworms. 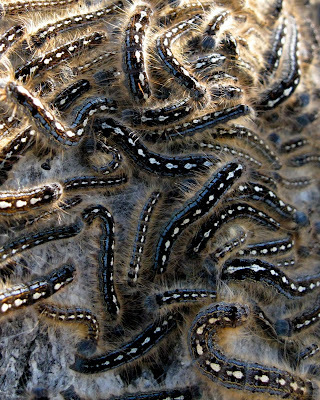 The cobwebby looking “bags” are a familiar sight in pecan trees where I live, but I had never, never, ever seen so many of the hairy little caterpillars. The supervisor was in the middle of a bagworm meeting, assigning maintenance staff tasks of pressure washing sidewalks and other good-riddance strategies. Miles down the road, I discovered a couple of his uninvited guests touring my jacket, headed for my neck. Shriek! Ick! Ick! Ick! A few bagworms would not deter us from our planned detour to New Orleans for beignets at Café du Monde in the French Quarter. I know, I know. What is so special about deep-fried dough with powdered sugar that gets all over you? When I figure it out, I will post about it. Walter had gotten word from the welcome center staff about a French Quarter Festival in progress, but we kept going. 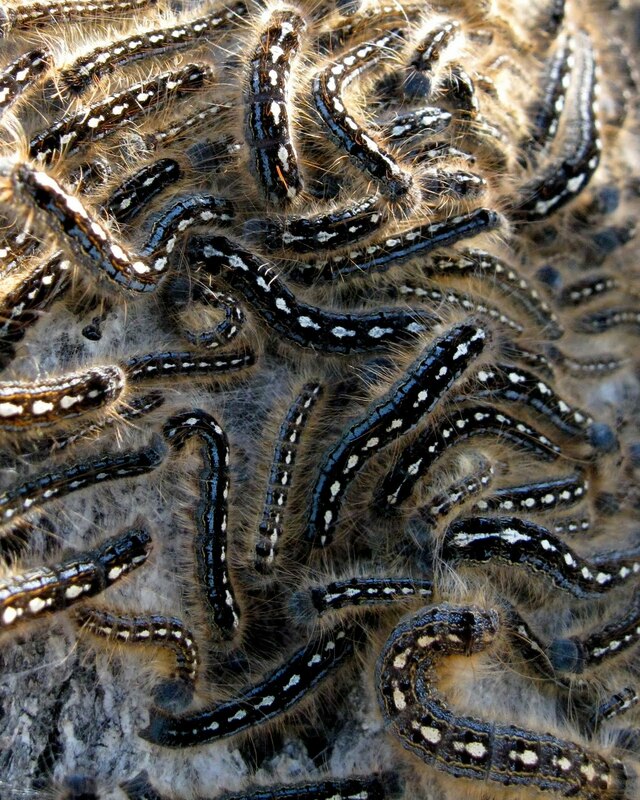 When we got to the French Quarter, the people were as thick as the bagworms. All parking lots were full. Traffic was backed up. Walter looked over at me and asked, ”How about we do this as a drive-by festival?” I agreed and we headed toward Prairieville. @mimi: You are so right! Crowded, sensory-overload festivals are still fun, but usually early or late for me rather than midday sun!